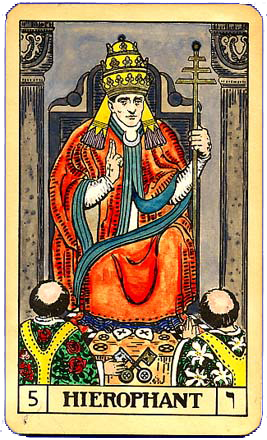 The Hierophant is the figure of a spiritual master. Symbolic of Divine knowledge, he represents the connecting link between personal and universal consciousness. Ruled by Venus, he values the ideals of Love, Harmony and Harmlessness. The sign of Taurus and The Hierophant card are associated with the practical application of spiritual understanding. Confer with The Hierophant for a moment of silence and listen to the voice within which will guide you to a Truth you can act on. The Hierophant image on journals, T-shirts, and mugs. Affirm: I Listen to the Voice of my Heart.